This case concerns Maasai pastoralists who were forcibly ejected from their land on Sukenya Farm, Loliondo, Northern Tanzania. Their troubles began in the 1980s when a parastatal company, Tanzania Breweries Limited (TBL), acquired 10,000 acres of land within Soitsambu village with the intentions of wheat and barley cultivation. The local communities contend that this acquisition was never legalised, as TBL failed to follow the required conditions such as consulting with the landowners; neither did they offer any compensation for the land. Out of the 10,000 acres it acquired, it only used about 700 for cultivation. 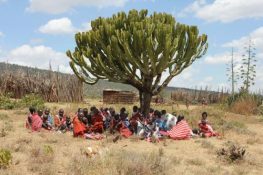 As such, life continued as normal for the Maasai, who continued to use the land for grazing and watering their livestock. They did so for a period of 19 years without any disturbance, a fact that led to the belief that they had legally become the landowners again. However, in 2006, TBL sold the land to Tanzania Conservation Limited (TCL) – a Tanzanian incorporated company, run by an American couple who own US safari company Thomson Safaris. There have been allegations of destruction of homes, livestock and harassment of villagers who were trying to access the natural resources upon their ancestrally-owned land to graze their animals and for water. In 2009, with MRG support, the community started legal proceedings before the local courts, bringing an adverse possession action on behalf of the villagers against TBL, which previously owned the land, and Tanzanian Conservation Limited, the current owners of the land and subsidiary of Thomson Safaris. In addition, the villagers sought an injunction seeking to stop further development on the land pending the determination of the case. The applications were dismissed in 2013 for procedural reasons but new proceedings were lodged several months later. The case was unsuccessful on all but one point. The court declared the transfer of part of the land to be illegal but offered no remedy or compensation. The community, assisted by MRG and local lawyers and partners, successfully sought leave to appeal and is now waiting for the appeal to be heard. MRG is also working with Earthrights International, who have successfully pursued a 1782 discovery action against Thomson Safaris in the US courts, which has given access to information relevant to the proceedings in Tanzania. In light of the alleged harassment and extra judicial arrests of the villagers, MRG lodged an urgent action request before the UN’s Committee on the Elimination of Racial Discrimination (CERD) in March 2009 and, as a direct result, CERD wrote to the Tanzanian Government stipulating a set of interim measures to curtail the harassment, and requesting further information from the Government. MRG has continued to follow-up with CERD, which submitted further letters to the Tanzanian Government in 2011 and 2013.